Pardon the dramatic title, but the relationship that is discussed here has been a point of contention among researchers of the Gordon line for a very long time. After explaining my position in numerous emails — sometimes briefly, sometimes at length — I decided to summarize everything on this page to which I can easily direct people in the future. There is also some additional evidence that has recently come to light through the widespread availability of DNA testing. Most people doing genealogy research in the U.S. are very interested in discovering their link to their overseas ancestors, and I am certainly no different. Since I still carry the Gordon family name, this relationship is of particular interest to me. My line of descent in this country is well documented starting with Charles Gordon of Monmouth County, New Jersey, who I will refer to as Charles II. Charles also had a presumed brother, Peter, who is sometimes called Peter Gordon of Crosswicks and has a number of present-day descendants who are active in genealogy. On the Scottish side, most genealogies that can be found on the Internet and other places show Charles II as having descended from the line of Robert Gordon, a Laird in the Aberdeenshire area. It is fairly well documented that Robert sent three sons to the East Jersey Colony in the late 1600s: Charles, John, and Thomas. Thomas Gordon became particularly prominent in the colony and has a well-known gravesite in Perth Amboy. Charles wrote a number of letters that are also well-known in New Jersey history, and died in 1698. I will refer to him as Charles I in the discussion here. Most genealogies show that Charles I of Scotland was the father of Charles II of Monmouth and Peter of Crosswicks. But there is almost no real proof of this other than the similarity of names, and this can only be considered circumstantial evidence. Over the years, as I have tried to find stronger evidence of this relationship, I have actually managed to find more evidence against the relationship than for it. I will now present the arguments for and against this father-son relationship that I have developed from my research. For reference, see the partial family tree graphic toward the bottom of this page. At this time, the only evidence for the relationship is from the somewhat unreliable This Old Monmouth of Ours by William S. Hornor. On page 250, he states of Charles I: “Some believe hiim to have been the father of Charles [II]; and Peter, and this seemingly is the most probable line of those two...”. And that is the extent of the “proof,” although Hornor himself goes on to tell an anecdote about a possible alternate origin of the two brothers. Most of this is in the nature of what might be called "negative evidence." That is, it does not establish the actual parentage of Charles II, but it does make it less likely that he was the son of Charles I.
Charles I's letters never mentioned his family, or especially that he had any family members with him in the Jersey Colony. Charles I died intestate in 1698 in the East Jersey Colony, and his personal effects were give to his brother, Thomas. If Charles had a family, it is unlikely that he would not have had a will. Even without a will, his property would most likely have gone to his children instead of his brother. Researchers of Charles II's brother, Peter, have also not found any evidence of his parentage. In Scottish naming practices, which were generally followed rigorously by the upper classes, the first son was named after the paternal grandfather and the second son after the maternal grandfather. Daughters were usually named likewise after their grandmothers. However, note that Charles II named his first son Peter, not Charles. His second son (John) and second daughter (Katherine) did follow this practice, as his wife's parents were John Hampton and Elizabeth Cloudsley. By this convention, Charles's father was more likely named Peter than Charles. Citing these naming practices might appear to be reading more into things than are there, but I can say with certainty that this naming pattern held in my Gordon family down to my great-grandfather's generation. This is more negative evidence, but I put it into its own section in order to better introduce it. The Y chromosome of a male is passed on almost unchanged from father to son. In other words, I got my Y-DNA from my father, who got it from his father, and so on all the way back up the family tree. What makes this useful for genealogical research is that the family surname also generally follows the male line. This means that my Y chromosome should have been passed down from a person named Gordon ever since there was a Gordon surname! A few years ago, I had my Y-DNA analyzed and the results were added to a master Gordon DNA Genealogy Project that is trying to establish relationships among the many branches of the Gordon family. And indeed, this project has established the Y-DNA characteristics of many of the known branches of the family that are discussed in some of the Gordon History pages on my web site. The problem here is that my Y-DNA does not fall into any of the known Gordon lines. In fact, it more closely matches another surname altogether. This is not all that unusual, and there are a number of plausible explanations. For example, it was not unheard of for a family in Scotland to change its name to that of its protecting clan, or for a husband to take his wife's surname for purposes of title or inheritance. But the point of evidence to consider here is that Robert Gordon of Aberdeenshire was a descendant in one of the main Gordon lines, which was especially well documented through the title that was passed down to him. 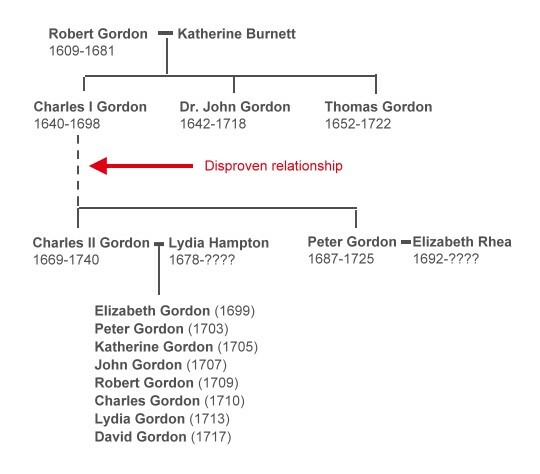 If that were the case, and if Charles of Monmouth were indeed descended from him, then my Y-DNA analysis should also match one of the main Gordon lineages. It does not, and this is yet more evidence against the assumed relationship of the two Charles Gordons. This graphic shows the relationships discussed on this page. Not all children are shown for all marriages here (but Charles II's list of children is complete as far as is known).